Tuesday, February 26th, 3pm. 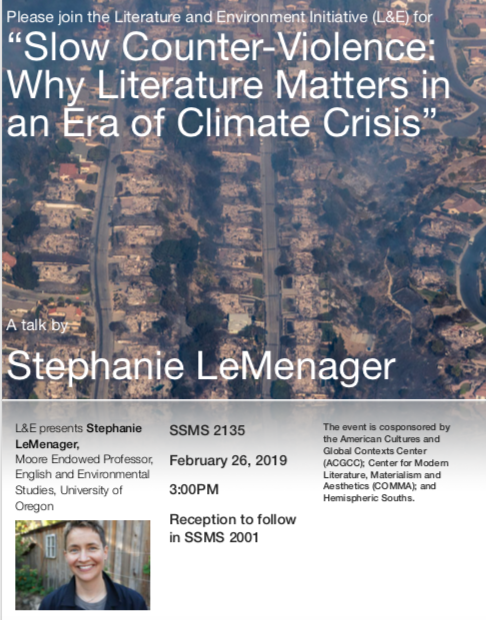 L&E presents “Slow Counter-Violence: Why Literature Matters in an Era of Climate Crisis,” a talk by University of Oregon Moore Endowed Professor Stephanie LeMenager. Reception to follow. Friday-Sunday, March 1st-3rd. 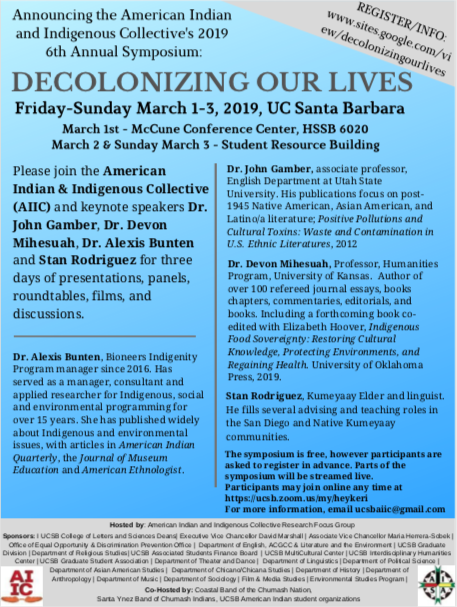 UCSB AIIC 2019 SYMPOSIUM: Decolonizing our Lives. Saturday, December 1st, 12pm-3pm. 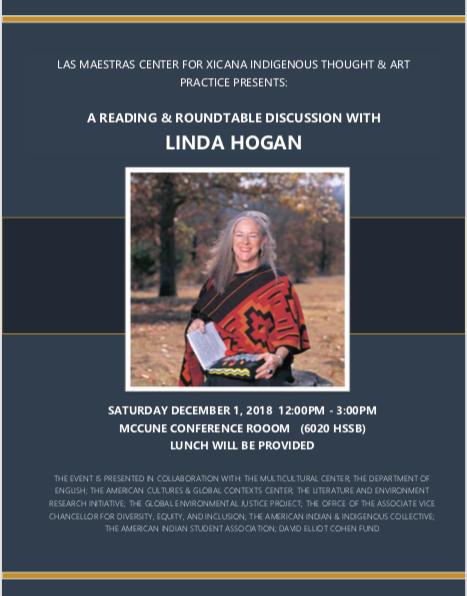 Roundtable with Chickasaw author and poet Linda Hogan. 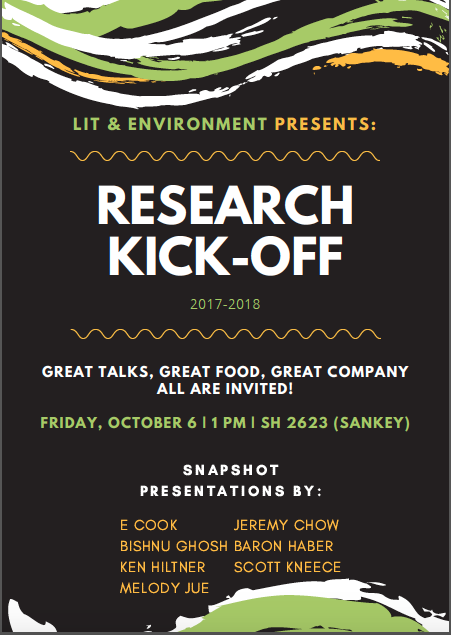 Friday October 6th, 1-2.30pm. Welcome event & Research Snapshot Presentations. Friday October 20th, 1pm. Nicole Seymour (Cal State Fullerton). 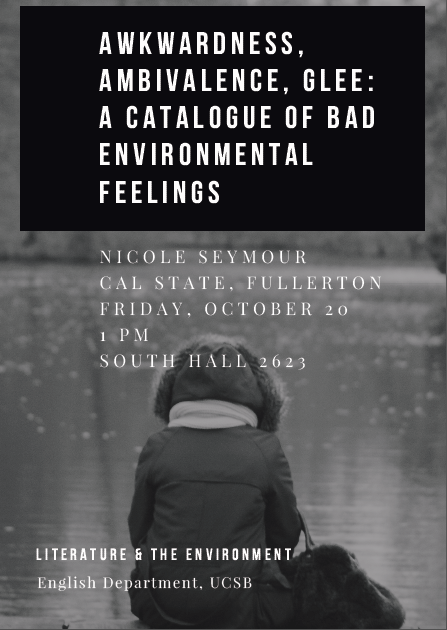 Nicole Seymour’s first book, Strange Natures: Futurity, Empathy and the Queer Ecological Imagination, won the 2015 scholarly book award from the Association for the Study of Literature and Environment (ASLE). Her forthcoming book, Bad Environmentalism: Affect and Dissent in the Ecological Age (University of Minnesota Press), recuperates irreverent and anti-sentimental expressions of environmentalism. 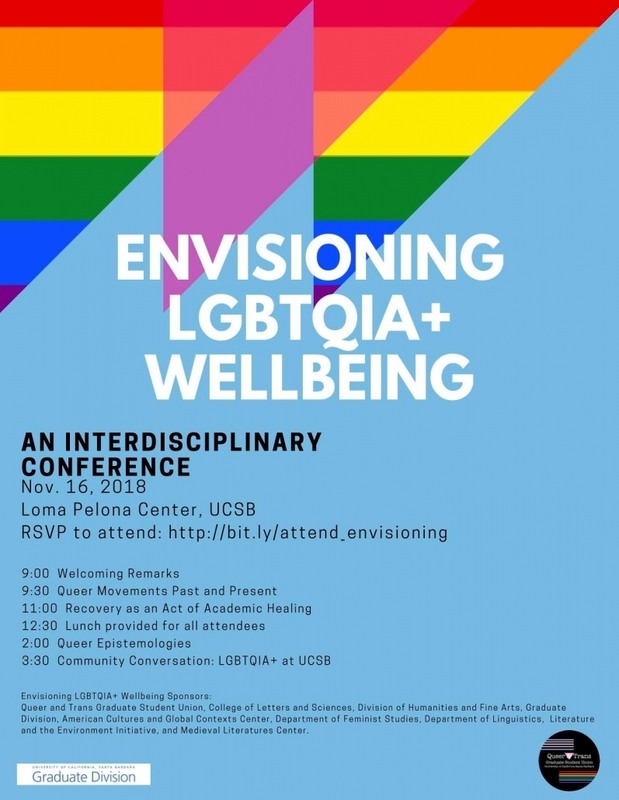 Wednesday November 15th, 2pm. International Scholars Event. 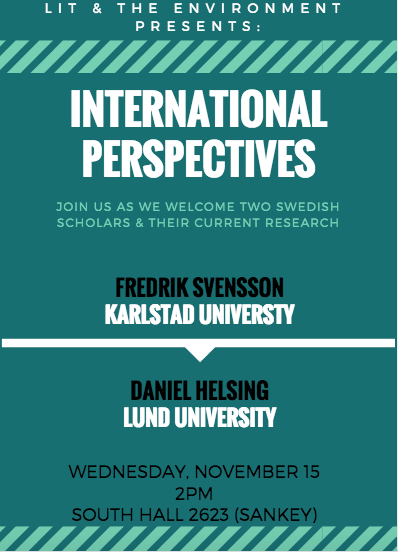 Join us as we welcome two Swedish scholars–Fredrik Svensson (Karlstad University) & Daniel Helsing (Lund University)–whose work speaks to the ways in which ecocriticism and the environmental humanities are being conducted in Scandinavia. Friday February 9th, 1pm. 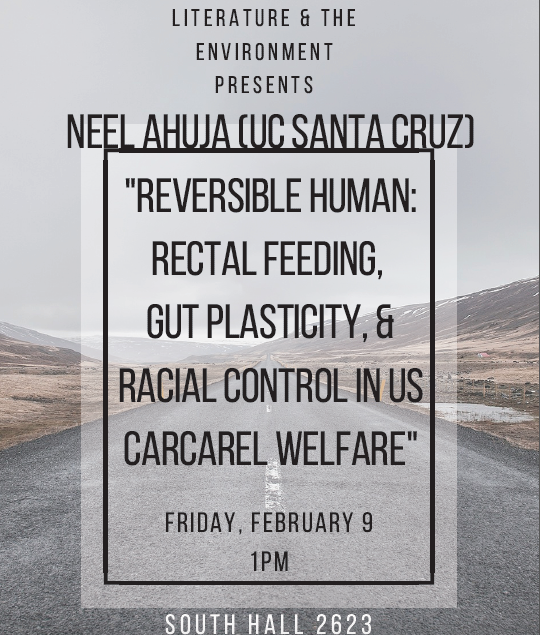 Neel Ahuja (UC Santa Cruz). Neel Ahuja’s research explores the relationship of the body to the geopolitical and environmental contexts of colonial governance, warfare, and security. He is the author of the book Bioinsecurities: Disease Interventions, Empire, and the Government of Species (Duke UP) and has written a series of essays on the transnational politics of human-animal relations. He is currently working on a new writing project analyzing global relationships between migration, war, and climate change. Friday February 23rd, 12pm. 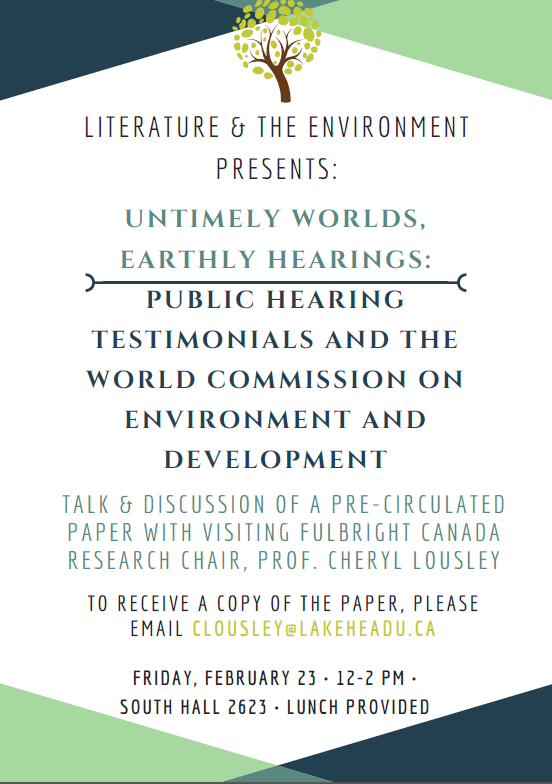 Cheryl Lousley (Lakehead University). Dr. Lousley researches in the areas of Canadian literature, environmental literary and cultural studies, feminist studies, and social and cultural theory. 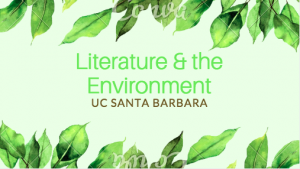 She is interested in the relationship between rhetorical and narrative forms and environmental politics and justice, particularly the representation and distribution of environmental risk at imagined scales of the local, national, and global. Her research in ecocriticism and contemporary Canadian literature has been published in The Oxford Handbook of Ecocriticism, Canadian Literature, Environmental Philosophy, Canadian Poetry, Essays on Canadian Writing, Interdisciplinary Studies in Literature and Environment, and elsewhere. The Canadian authors she studies include Larissa Lai, Margaret Atwood, Dionne Brand, Barbara Gowdy, Thomas King, Matt Cohen, David Adams Richards, Sheldon Currie, and Douglas Coupland. Her research on cultural forms and practices of global identity during the rise of globalization and sustainable development has been published in Emotion, Space & Society and in Popular Representations of Development: Insights from Novels, Films, Television, and Social Media (Routledge, 2013). Wednesday April 4th. Christina Gerhardt (University of Hawai‘i). 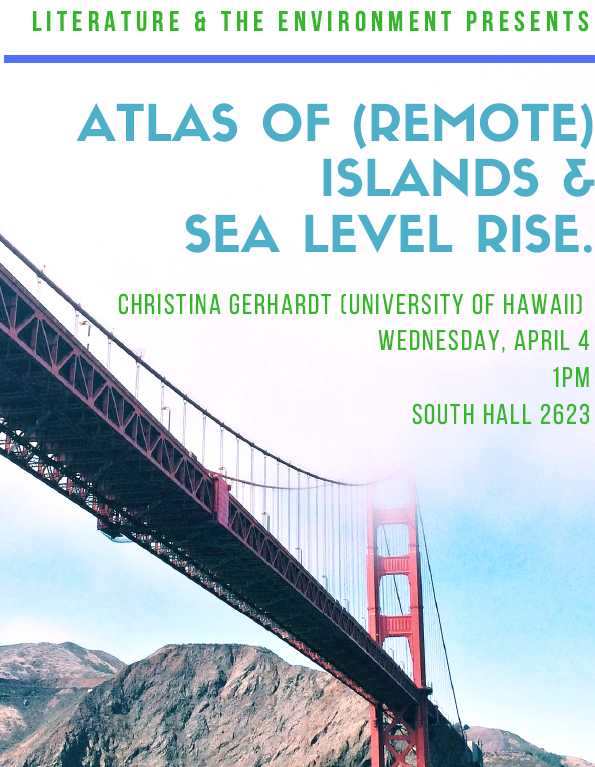 Christina Gerhardt is Visiting Scholar at the University of California at Berkeley and Associate Professor of Environmental Humanities, Film and German Studies at the University of Hawaii. She is the author of Atlas of (Remote) Islands and Sea Level Riseand the editor of Climate Change, Hawaii and the Pacific. She has held fellowships from the Fulbright Commission, the DAAD and the National Endowment for the Humanities. She has held visiting appointments at Harvard University, the Free University Berlin and Columbia University and taught previously at the University of California at Berkeley. Her writing has been published in the journals Capitalism, Nature and Socialism, Environmental Humanities, Humanities, Mosaic, and in the edited volumes Water: An Atlas; and My Ocean Guide.